It's an actual flashlight with ultra-bright LED bulb and an impact weapon, but most importantly, it's a stun gun with an unheard of 1-million-volt charge that will knock down any attacker. They'll think it"s just a flashlight until its too late. It's even rechargeable and includes 120v/60Hz wall charger. 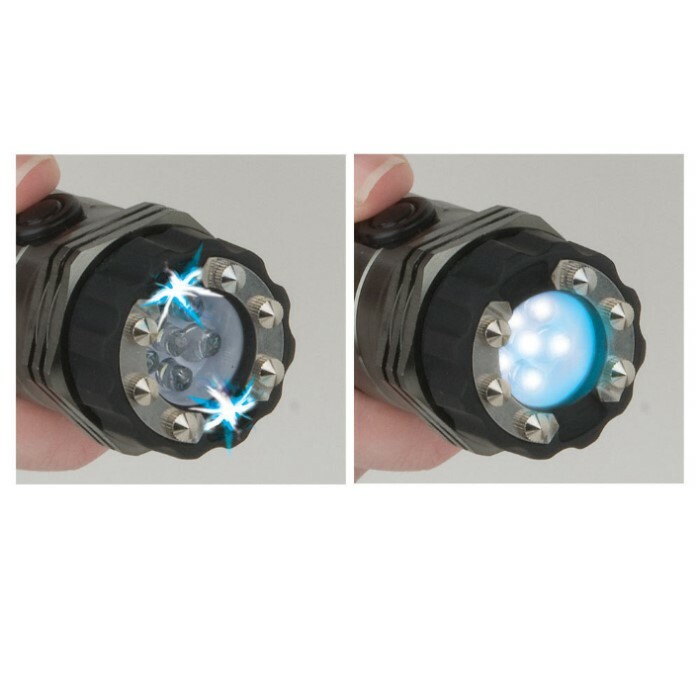 Please note that the current production of this item features one very bright LED which replaces the six bulbs used in older models. 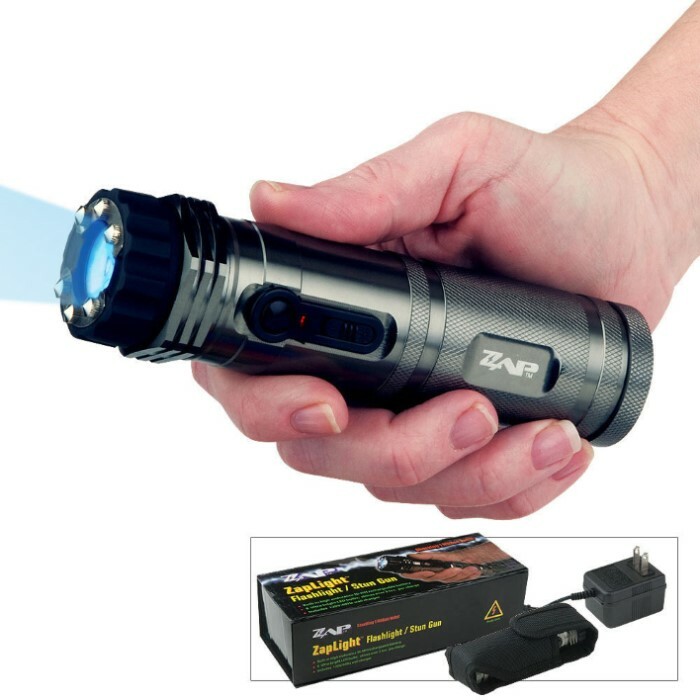 Awesome stun gun and flashlight! 5/5 I would recomend this to anyone! Even if all you really need is a rechargable flashlight. Great quality! Just took this out of the box and I love it already! It feels really solid, flashlight is crazy bright, and man it sounds intimidating. I would not want to be on the receiving end of this beast. It shipped immediately, arrived earlier than the estimated shipping date, and it was brand new out of the box for 15 bucks less than the other guys. I would definitely recommend this stun gun and this website to anybody. Thanks trueswords you guys are the best! OMG this is so AWESOME!!! I can't believe how cool this buy is! I got the new version as well with one light bulb instead of six but, it lack nothing and is not inferior to the older model. This stun gun flashlight trips me out so much! When I first tried the stun, the sound by itself scared the *%$# out o me! The light is so bright and what makes all the more worth it was how it has a glow ring within!!! I like things the glow!! This is a must have for sure! No kidding! I mean it! Only $50!! I have yet to build the balls to try it on myself... o__O The best part of it in a way is that this thing looks more like a Jedi Lightsaber handle!! I like to think the taser is Force lighting out of a Jedi Lightsaber^^ Again, I must say it is a must buy and IT IS AWESOME!!! The one I have got is a new model, which has a rubber grip on it. Very nice product, one bulb instead of six bulbs but without compromising the brightness, hopefully can save more power compare to the old model. Buy a separate case! Overall it is very good. The only problem is the carrying case that comes with it. It has a clip yes but over time it wears out and slips of your belt very easily. I had mine for bout 3 month n lost it. I suggest buying a separate case that has a belt loop n not a clip. I got this stun gun for Christmas just yesterday and haven't taken my hand off it since. its a very sweet stun gun. I worked up the courage to try it on myself, and just a split second of it will make you re-think about hitting yourself a second time. All I can say is, wow! It looks fantastic, flashlight works very well, and the test fire is very intimidating. It's a great way to protect yourself discreetly. I even worked up the bravery to test it on myself, and even through a shirt and two thick coats, it left a burn mark and knocked me down, just like the other reviewer. And that was only for 1/4 of a second! You'll always feel safe with this little monster at your hip.